Arsenal defender Laurent Koscielny will be out for six months after surgery on a ruptured Achilles tendon, says Gunners manager Arsene Wenger. 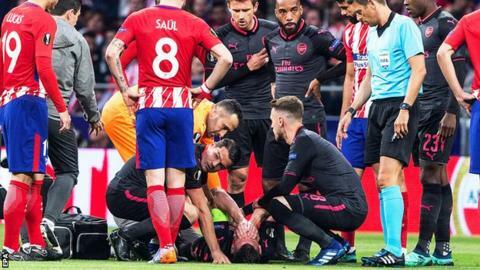 Koscielny, 32, was carried off 12 minutes into Arsenal's Europa League semi-final second leg defeat by Atletico Madrid last Thursday. France manager Didier Deschamps had already confirmed the centre-back would miss this summer's World Cup. "You will not see him until December at best," said Wenger. "People have always inflamed tendons but they don't rupture but in his case it went. I don't know why. "The recovery will be full because the advantage of surgery is that it heals the inflammation." Frenchman Wenger will leave Arsenal at the end of the season after nearly 22 years as manager. The Gunners are confident of naming his successor before the World Cup starts on 14 June. Wenger said the Arsenal board had not spoken to him about it but believes "the earlier the better" over the timing of the appointment. He added: "I must say that the squad doesn't need much because there is a huge potential in there with a good spirit. "We need two or three additions and this team will compete for the championship next year." Juventus boss Massimiliano Allegri and ex-Barcelona coach Luis Enrique have been linked with the job. "All these guys are very competent and all good names," said Wenger. "In a way, I will be like every Arsenal fan in that I will wait until they have made a decision and I will support they guy to do well. "It's better I stay neutral. If the club wants my advice I will give it to them but it is better I don't talk publicly about it." In terms of his own future, Wenger says he had had more offers than he expected but would consider them after the season finishes. "At the moment, I focus on doing my job. I didn't analyse or consider anything," he said. "I want to work well until the last day of my contract and then I will think about it - rest a little bit and think about where I go from there. For sure I will be active, my brain demands work. "What I will do, I don't know yet. I like green grass and working on it every morning."